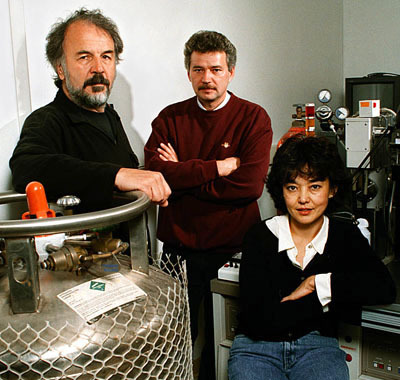 Harry Noller, Marat Yusupov, and Gulnara Yusupova at UC Santa Cruz in 1999. The Royal Swedish Academy of Sciences has awarded the 2012 Gregori Aminoff Prize in Crystallography to Harry Noller, the Sinsheimer Professor of Molecular Biology at UC Santa Cruz, and two of his collaborators, Marat Yusupov and Gulnara Yusupova of the Institute of Genetics and Molecular and Cellular Biology in France. The prize recognizes the researchers for their atomic-level mapping of the structure of the ribosome, a complex molecular machine found in all cells that translates the DNA code into functioning proteins. Their achievements provide a basis for the development of targeted antibiotics. Ribosomes are fragile complexes made of long chains of RNA and proteins interlaced together in complicated foldings. The ribosomes constantly change shape as they carry out protein synthesis. To determine the atomic structure of the ribosome, researchers used a technique called x-ray crystallography, which requires pure crystals of the structure being studied. But crystallization of the ribosome proved to be a major challenge. The husband-and-wife team of Yusupov and Yusupova started their work on the crystallization of ribosomes in the 1980s with collaborators in the former Soviet Union. Later they teamed up with Noller and worked in his lab as visiting researchers at UC Santa Cruz. In 2001, the team succeeded in producing clean crystals of whole ribosomes from bacteria, enabling them to determine the detailed structure of the bacterial ribosome. At the time, it was the largest molecular structure ever solved by x-ray crystallography. Ribosomes in the simple cells of bacteria are different from those in the more complex cells (called "eukaryotic" cells) of organisms such as humans, so efforts continued to map the structure of the eukaryotic ribosome. Noller and the Yusupovs published several milestones in the scientific journals Nature and Science. Finally, in 2010, researchers in the Yusupov lab in France published a high-resolution map of the eukaryotic ribosome. With detailed knowledge of the structures of both bacterial and eukaryotic ribosomes, biomedical researchers can look for ways to knock out protein production in bacteria without affecting human cells. This is an important first step toward understanding and producing targeted antibiotics. The Aminoff Prize is intended to reward a documented, individual contribution in the field of crystallography, including areas concerned with the dynamics of the formation and determination of crystal structures. An award ceremony will take place in Stockholm in March 2012 at the annual meeting of the Royal Swedish Academy of Sciences. Noller has received numerous awards and honors for his work, and his laboratory continues to make important advances in understanding how ribosomes work. He earned his bachelor's degree in biochemistry at UC Berkeley and his Ph.D. in chemistry at the University of Oregon. Before joining the UCSC faculty in 1968, Noller held postdoctoral positions at the MRC Laboratory of Molecular Biology in Cambridge, England, and the Institute of Molecular Biology at the University of Geneva, Switzerland. He was elected to the National Academy of Sciences in 1992.